Kenyan flag carrier set to add a total of nine Dreamliners to its fleet. Boeing [NYSE: BA] and Kenya Airways celebrated the delivery and flyaway today of the Kenyan flag carrier's first 787 Dreamliner. 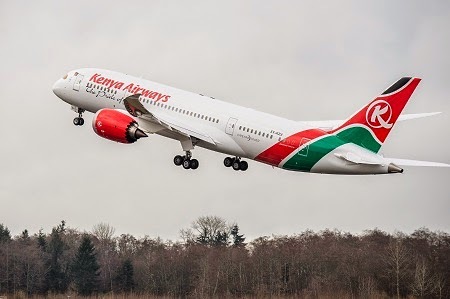 The airplane departed Paine Field in Everett for a 7,800 nautical mile (14,456 km) nonstop flight to Kenya Airways' home base in Nairobi at Jomo Kenyatta International Airport.